Essential readings on volunteering and volunteer management for social work, social policy and urban management. The demand for volunteering in the context of childrearing is increasing. This is due in part to the disintegration of informal networks surrounding children and their families, as well as to the ambition of national and local governments to decrease citizen dependence on public services. Another reason, albeit less frequently mentioned, involves the current economic crisis and cutbacks in social services, including youth care. Professionals and managers are thus facing many complex questions. Which tasks should be performed by professionals, and which could be entrusted to volunteers? How can professionals and volunteers work together productively? How can institutions be re-organized in order to incorporate volunteers? 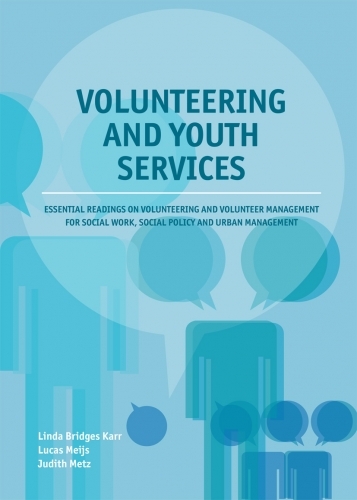 In Volunteering and youth services, we present essential readings on volunteering and volunteer management for students, professionals, managers, and board members in various fields, including community and youth services, social work, youth care, education, parenting, management, and public administration. Our objective is to help readers understand and cope with the complex phenomenon of volunteering. The book consists of three major sections. Part I (Volunteering) presents a general introduction to volunteering and volunteer management, as well as current trends in these areas. Part II (Youth) provides an overview of the limited existing knowledge on volunteering and youth development. Part III (Special Topics) offers a glimpse of several specialized issues relevant to working with young people, including co-production and episodic volunteering. The chapters in this volume are based on publications by the editors and various international experts.